I’d love to. Thank you for inviting me to chat on your blog. 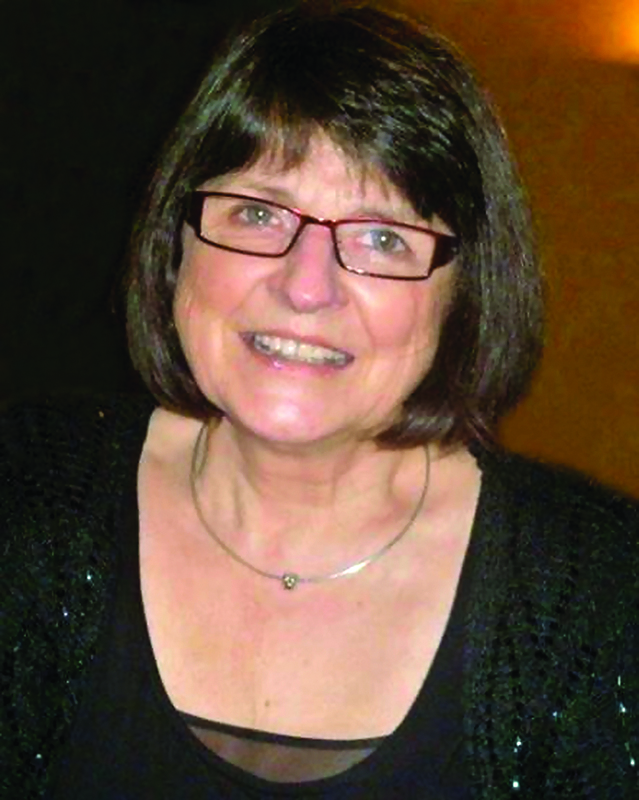 I have been an actress for more than thirty years working in repertory theatre, the West End, film and television. I am also a radio presenter and journalist, writing articles for newspapers and magazines. However, these days, I write fewer articles as my time is taken up with writing a saga of five novels set in WWII. I was brought up in a busy working class pub in Leicestershire. The pub was a great place for an aspiring actress and writer to live. There were so many wonderful characters to study and accents learn. At twenty-four, I gave up a successful hairdressing salon in Rugby, and a wig-hire business providing wigs for The Belgrade Theatre in Coventry, and the Palace Theatre, Watford to go to East 15 Drama College. While working at The Belgrade, I met Patricia Phoenix, aka Elsie Tanner from Coronation Street. I told her that I had auditioned for E15, and a couple of weeks later I was offered a place. At the same time, Pat and her actor husband, Alan Browning, were going on tour to Australia and New Zealand with, Gas Light. She offered me the part of the maid and an Equity card to go on tour with them. However, I had dreamed of going to Drama College for years, so I turned Pat down. It would have been an exciting rollercoaster ride, but I have no regrets. I sold my salon and wig hire business, went to drama college and had a fairly good career. Theatres where I have worked includ, The University Theatre, Newcastle-upon-Tyne, The Citizen’s Theatre, Glasgow, Duke’s Playhouse, Lancaster, to name but a few. I spent a year doing Shakespeare at The Young Vic in London, and I did my share of commercials, a couple of small parts in films and some television including, Angels and, The Bill. I have worked with some great actors. 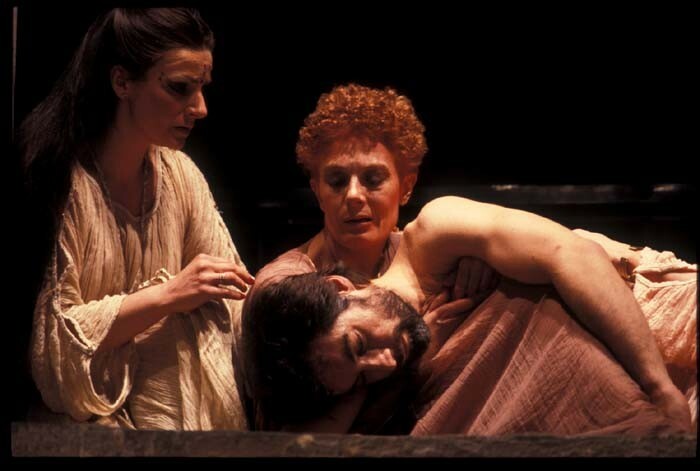 The one I leaned the most from was, Vanessa Redgrave who played Cleopatra in, Antony and Cleopatra, at the Theatre Royal in the Haymarket. I gave up acting for love. I was forty and thought it was probably my last chance to settle down. I signed a two-year contract with a company I had previously temped for, and became one of the millions who travelled into the city of London on the Northern Line every day. At that time there was little, or no, work for older actresses. And, having been out of the business for ten years, I’d have had to start again. Would I go back now? In a heartbeat. But only for the challenge of it. A couple of episodes of Emmerdale, EastEnders or Coronation Street, would be fun. I have no desire to go back into the business. I am a writer now and I love it. Anyway, after a couple of years working in an accounts office, I was desperate to do something artistic, so I completed a two-year correspondence course with The Writer’s Bureau, taught myself to touch type, and began writing articles. In 2010, having lived in London for thirty-six years, I returned to the Midlands, swapping two window boxes and a mortgage, for a garden and the freedom to write my first novel, Foxden Acres. Applause followed, and then China Blue. I am now researching my fourth novel, The 9:45 Train To Bletchley, which I hope to publish in 2016. 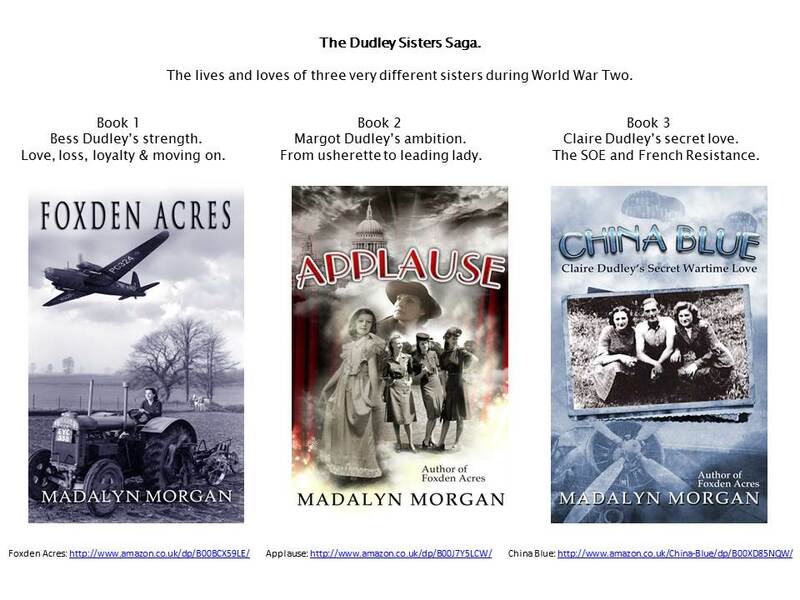 The Dudley Sisters Saga is about the lives of four very different sisters during WWII. The first three novels, Foxden Acres, Applause, and China Blue, are available on Amazon – eBook and paperback – and in several independent and High Street bookshops. What led you to choose an acting career? I can’t remember a time when I didn’t want to be an actress. I auditioned for a television series in Birmingham when I was fifteen called, Crossroads, and was offered the part of the Motel owner’s niece. However, even though I would have been chaperoned, my parents wouldn’t let me live in Birmingham during the week. I always had the lead role in the school plays and when I left school, I joined the local armature dramatic society, but it wasn’t enough. So, when I had done what my parents wanted, I sold my businesses and did what I wanted. At 24, I went to Drama College. Do you find that your experience as an actress has helped you with your writing? Yes, having been an actress helps massively. I was a method actress. I believed I was the characters I played. Characters are not born when the curtain goes up, or when a book is opened. They have had however many years of life before that. It is what has happened to them before, that makes them who they are, and makes them react to situations the way they do. It is exactly the same in my writing. Every character has a history. I like to think I can walk in their shoes. Would you ever consider script writing for TV drama or a movie? No, I have no intention of diversifying further. I am busy enough researching and writing novels and articles – and looking after my house and garden. My readers often tell me that, The Dudley Sisters’ Saga would make a good television series. I think China Blue, being a wartime love story with an English WAAF and a Canadian pilot who are recruited by the SOE, and parachuted behind enemy lines to work with the French Resistance, would make a terrific tele-film. It is something I shall look into when the saga is finished. When you get time to read, who are your favourite authors? There’s a question. The first part is easy, I read in bed. The second part is difficult. When I’m writing, I read in the genre. I have to read a lot of research books. My next novel visits Bletchley Park, so I am currently reading, Enigma. I shall read Sinclair McKay’s books about Bletchley, and Tessa Dunlop’s book, giving accounts of women who were at Bletchley. I have just finished, The Dandelion Years, by Erica James, which was terrific. I have Robert Harris in my Bletchley reading pile, Ben Macintyre and a couple of Penny Grubb’s novels, because besides loving her female detective, Annie Raymond, Ena, the youngest Dudley sister has to become a bit of an armature sleuth to clear her name when information goes missing that she is responsible for. I do my best to read novels written by friends, but not when I am doing research. The last book in the Dudley saga brings the four sisters and many of characters in their stories together. It’s a murder mystery and for novel I shall be re-reading the fabulous, Lesley Horton’s crime series. Again a difficult question, there are so many. The most interesting holiday was on an Indian Reservation in Granite Falls, Minnesota, USA. In the summer of 1961, aged eleven, my parents sent me to visit my aunt who married a Native American and had moved to the US to live. I spent six weeks on the reservation in Granite Falls, Minnesota, with my uncle’s parents who I called grandma and grandpa. Grandma, a direct descendant of five Great Sioux Chiefs and the Elder of the community, threw a big summer Pow-wow for me and adopted me into the Dakota Sioux tribe. The above photograph was taken in February 1992. Grandma gave me my Dakota Sioux name during a small family dinner. It is, Wacantkiya Win, and means the charitable girl. This photograph represents an important and wonderful time in my life. 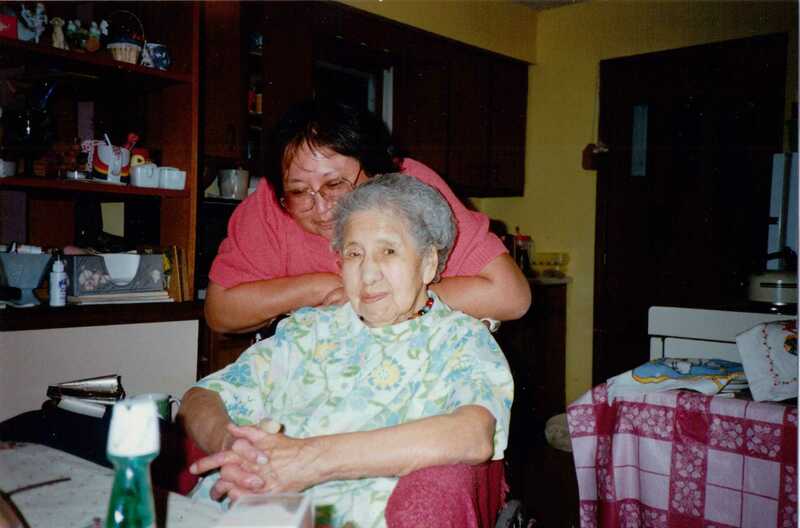 In the wheelchair is my adoptive, Native American Grandma, Elsie Cavender. Behind her is her daughter, Lorraine Cavender, who saved my life when I almost drowned in The Yellow Medicine River. Now a Desert Island Discs moment – if you could pick four tracks to take with you onto a desert island what would they be and why? What a question to ask a radio DJ. I have dozens of Albums, hundreds of 45s, and over 5000 CDs. After a lot of thought, can I give you five, please? Mocking Bird – Dusty Springfield. Mocking Bird was one of the first tracks I played on my radio show, 15 years ago. I played a live recording of Dusty singing, Mocking Bird at the BBC. It was her first live television performance, and she was amazing. Blowin’ In The Wind – Bob Dylan. I love the protest songs of the 1960s. Bob Dylan sang, Blowin’ in the Wind, during Dr Martin Luther King Jr’s historic march on Washington in August 1963, when Dr King said those immortal words, “I have a dream.” On the 50th anniversary of the march, I was commissioned to write an article about Martin Luther King Jr. It was a privilege to be asked, but a greater privilege to learn about the man who risked everything to fight for change and freedom. Yesterday – Beatles. Not only a beautiful arrangement, but the lyrics remind me of some wonderful people who I have been lucky enough to know, and love, who are no longer with us. Bohemian Rhapsody – Queen. Because it is, Brilliant. Want to know more about Madalyn? Her social media links are listed below. Chatting on Jo Lambert’s Writer blog, Tuesday Talk. Fascinating blog, Madalyn. Maybe one day you’ll write an autobiographical account of your acting career. Your experiences certainly give real richness to your novels and I love the idea that the Annie Raymond mysteries have helped to shape Ena. Penny, I could see, Ena in Annie, (or is it the other way round? No matter), when I first read The Doll Makers after doing your course at Caerleon. I loved her character. She was very real to me and, as I have said, I could see the youngest Dudley sister, Ena, while I was reading the novel. I love the Annie Raymond mysteries and can’t wait to get started on, Buried Deep.